Justin Kawabori founded his boutique consulting firm in 2009. He knew that any good marketing/PR firm should offer customers a good-looking, high-functioning website experience, but he was short on capital (as many startups are). Latarial Web Strategies offered him a well-built, fully integrated website for a fraction of what other small business web development companies charge. 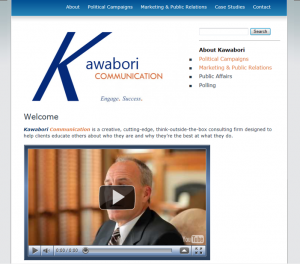 Kawabori Communication was unique in that they came to us with professional photographs, extensive online content and comprehensive branding in hand. So we served them by taking their vision and making it a reality.